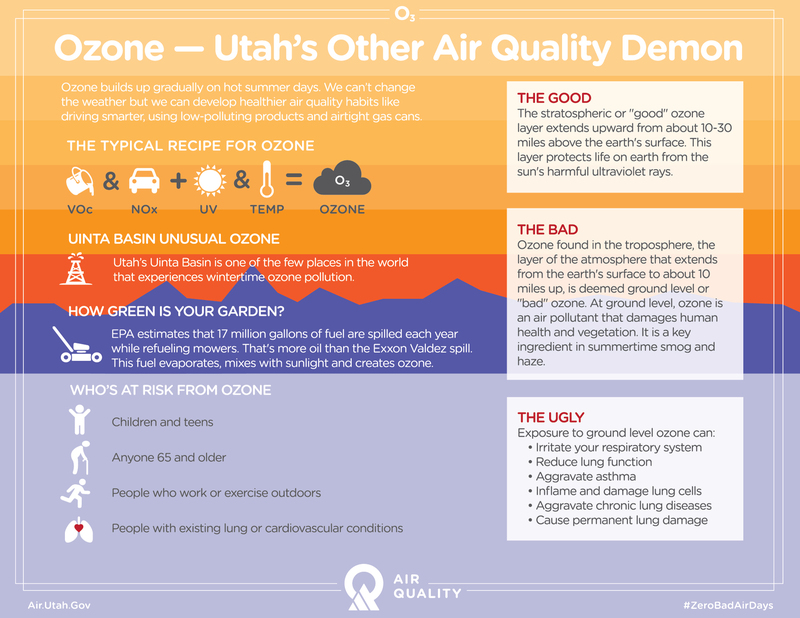 The Wasatch Front and parts of the Uinta Basin were designated as Marginal nonattainment areas for ozone this week by the Environmental Protection Agency. A Marginal designation is the least stringent classification for a nonattainment area and doesn’t require the state to submit a formal State Implementation Plan (SIP). Areas along the Wasatch Front affected by the new designation include all or part of Salt Lake, Davis, Weber, Tooele, and Utah counties. Areas in the Uinta Basin affected include portions of Uintah and Duchesne counties below 6,250 feet. This designation means that while the state exceeded the 8-hour, 70 parts per billion (ppb) standard, it did so by a small margin. A marginal designation gives Utah three years to come up with ways to meet the standard. Ozone is formed when vehicle emissions and industrial sources mix with sunlight and heat. Levels can rise to unhealthy levels on hot, summer days and trigger a variety of symptoms, including coughing, throat irritation, and chest pain. Prolonged exposure can lead to lung damage. DEQ will continue to take steps to address ozone pollution in the state. The Air Quality Board enacted 14 rules this past year to limit the emission of Volatile Organic Compounds (VOCs), a precursor to the formation of ozone. The upcoming production and sale of Tier 3 fuels in Utah will significantly reduce emissions of nitrogen oxides (NOx), another ozone precursor. The new permit-by-rule for small oil and gas operators in the Uinta Basin and emission-control requirements for oil and gas storage tanks, dehydrators, VOC-control devices, and Leak Detection and Repair (LDAR) will help reduce emissions from oil and gas operations in the Uinta Basin. 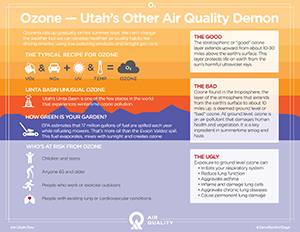 Visit DEQ’s ozone web pages to learn more about the health impacts of ozone, Governor Herbert’s recommendation to the EPA for ozone nonattainment areas in Utah, and the Division of Air Quality’s technical analysis to support the recommendation.